This morning at the St. Paul RiverCenter, the Herb Brooks Foundation assembled a panel of the leaders in the hockey community to discuss issues and solutions surrounding player safety in ice hockey at all levels. The purpose of the event was to raise awareness in the hockey community about the issues facing the game and to discuss possible solutions. Each of the 13 panelists introduced themselves and provided a brief history of their invovlement in the game. Minnesota Governor, Mark Dayton, made the opening remarks and told about his experiences playing hockey as a youth, high school and Division 1 player at Yale College. Player safety takes the spotlight at the Herb Brooks Foundation Safety Summit as part of the boys sate high school hockey tournament in St. Paul, Minnesota. March is a busy time of year as winter sports wind down and spring/summer sports wind up. This is a time of year where the demands on parents to get kids to their in-season activities and the early sessions of the next season is daunting. Being a parent is hard with all of the pressures that your kids place on you and the pressure to participate non-stop all year-round in almost every sport. A longtime youth hockey coach advises sports parents to just say no, to place limits on excessive sports, and have their kids spend more time on things that matter more in life in the long run. Her son's decision to retire from baseball at the ripe old age of eleven to focus on football was tough to take, says one mom, but eventually shock and denial gave way to acceptance. Girls Can Be Baseball Catchers Now Too! When my sisters and I were growing up, my father loved to spend time with us in the back yard (and later at the local school diamond) playing baseball. We never used a softballs, always baseballs. My dad had been a stand-out baseball pitcher and catcher for his high school during the World War II. 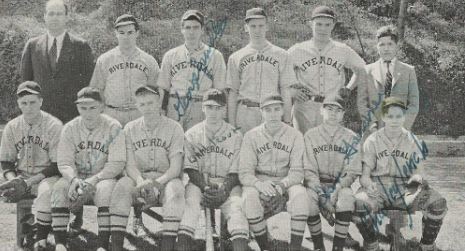 He had hoped to play professional baseball but his dreams and elbow were shattered by a bullet while serving on the aircraft carrier Bon Homme Richard in the Pacific. Frankly, I also think the wear and tear of pitching also left him some serious rotator cuff issues, as he had a difficult time throwing very far as he got older. When I was a child I wanted to play baseball, like my dad, who was a catcher and pitcher in high school but whose dreams of playing professionally ended during World War II. I went on to be a softball catcher, and one of my sons was also a catcher. With spring arriving, the thoughts of boys - and now, girls - turn once again to baseball. The American Academy of Pediatrics recommends softer baseballs for youth players under the age of 12 in a 2012 Policy Statement. Young baseball and softball players who receive direct ball impact to the chest wall directly over the heart may develop sudden cardiac arrest, a condition called commotio cordis. Teaching batters to turn away from an inside pitch, and pitchers to react as quickly as possible to a batted ball hit back at them can help reduce the risk, and an AED and a someone trained in CPR should be on site at all times to increase the chances of survival.